The Fischer–Tropsch synthesis of long-chain hydrocarbons is described here along with the process involved. Catalysis plays a fundamental role within this method, and therefore information on the diverse catalysts used is given here. Different kinds of reactors and configurations are also used, and a description of the solutions used is provided together with the main reactors’ parameters and catalysts utilized. Naturally, the diverse reaction parameters are also affecting importantly the yields and the rates involved and, for these reasons, this part is taken into account as well. The kinetics of Fischer–Tropsch synthesis is characterized by several models which are provided in literature, and some emphasis is given here on the theory related to the chain growth probability and the distribution of the products in FT synthesis. The chapter ends with the theory of the syngas treatment in FT synthesis. The wet-cold gas cleaning process is treated here together with the dry-hot gas cleaning process. 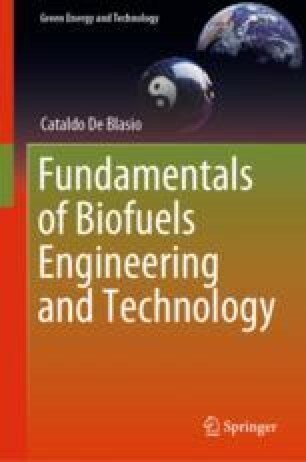 Finally, some details on biomass gasification methods are given along with the main chemical reactions involved. Nature is like a painting of Monet, very often when you get close to part of nature, it’s like walking up to an impressionist painting: you see less and less. All you see is little dots. In order to understand the meaning and the importance and the law contained in physics, you must step back and back to see the all and the perfection. Robert B. Laughlin, Nobel Prize in Physics 1998.